This yellow buttonhole is perfect for a wedding. Unique greenery and the addition of pearls give even simple cushion mums a classy look! When I make a boutonniere I tend to wire the individual flower heads and leaves. This gives me the control over the exact placement and the direction I want them to face in the design. I wired this cushion mum by pushing a 26 gauge florist wire through the calyx (the bottom green part under the flower petals). You can also wire using the hairpin method, which pushes a wire up parallel to the stem, comes out above the flower head and is then bent into a hairpin shape. Either way works - each florist tends to do it the way they are most comfortable. 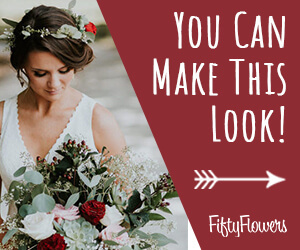 The point is to secure the flower head so that it doesn't snap off as you are handling and pinning the boutonniere onto the lapel. I inserted a second thin wire at a 90 degree angle to the first and then bent down all the wires parallel to the flower stem. Using professional florist tape, I cover the wire. Pull gently, stretching the tape around the step. Stretching makes the tape sticky and it will adhere to itself as you wind it down the stem. The mark of a good designer is that all the mechanics of the design (tape, stems etc.) are concealed or used in an attractive way that they are part of the design. Seeing bare wires or having awkward, unwieldy or bulky stems doesn't look good and give a tone of being an amateur. I love using pittosporum because of the unique look and texture of the leaves. It has a smooth, waxy feel and comes in both solid green and variegated. I usually spray all fresh greens with a plant polish such as Leafshine. Leaves sometimes get a splotchy white residue left when hard water evaporates or have a dusting of pollen. Leafshine will prevent that and dries to a nice, glossy finish. I cut or pluck a single leaf from the pittosporum stem. I used corsage tape and florist wire to stem the single leaf. Thread the thin wire through the leaf base like a sewing stitch. Bend the wires down parallel to the stem and tape securely with floral tape. Wiring the pittosporum leaves makes them easy to bend into the angle you want and gives them a long stem for attaching to corsages and boutonniere.